Naughty Elves - The Trump Kids got their hands caught in Santa’s cookies and milk as they tried to raise big bucks for access to their daddy. One has to ask what’s next because as we all know elves never stop trying to please Santa. 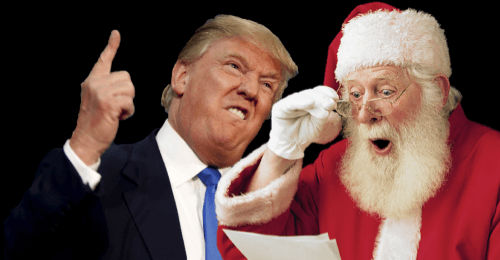 Grinching Big Oil- Obama steals Christmas future from oil execs that saw Trump as their path to hack into the Atlantic, disrupt Americans view of the oceans natural beauty, diminish our access to the sea’s wildlife and then charge us 3 bucks a gallon for the privilege of it. No Room at the Inn- The children of undocumented workers prepare for the worst as it becomes apparent that the only promise that Trump will ultimately keep will be to deport their bread winning parents. It seems that the inn’s are full and the mangers are now run by private prison firms.